Last update, I discussed that I felt the 1750+/- zone was important resistance, and that the market was hovering in a larger inflection zone. Since then, the S&P 500 (SPX) has moved less than 2 points on a closing basis -- so the battle is still underway -- however, bears pulled an interesting reversal in that time, and now have the potential to grab the ball. We'll start off with the one-minute chart: The pattern that looks best to my eye is shown in blue. Interestingly, as I was drawing this chart, the E-mini S&P futures (ES) were up about 8 points, which would have blown out my preferred count. But ES has since declined to +4, which is back into the zone where my preferred cash count can work. 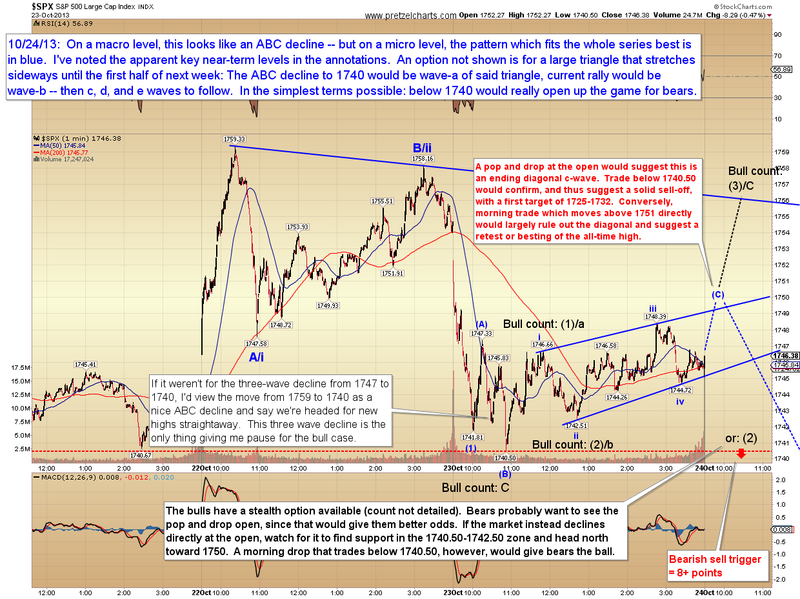 The 30-minute chart shows the market found support at the price point I noted in the last update (1740). 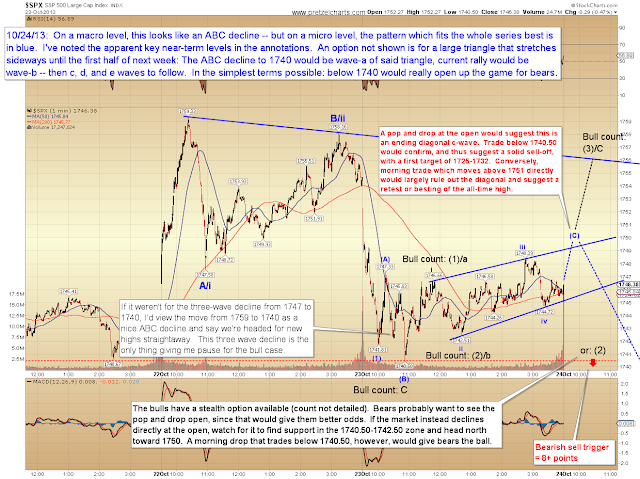 Bears would gain a major foothold on this market if they can reclaim that zone and turn it into resistance. If bulls continue to hold that zone, then we're simply witnessing a back-test of support, and bears will have to go back to sharpening their claws while waiting for the next opportunity. 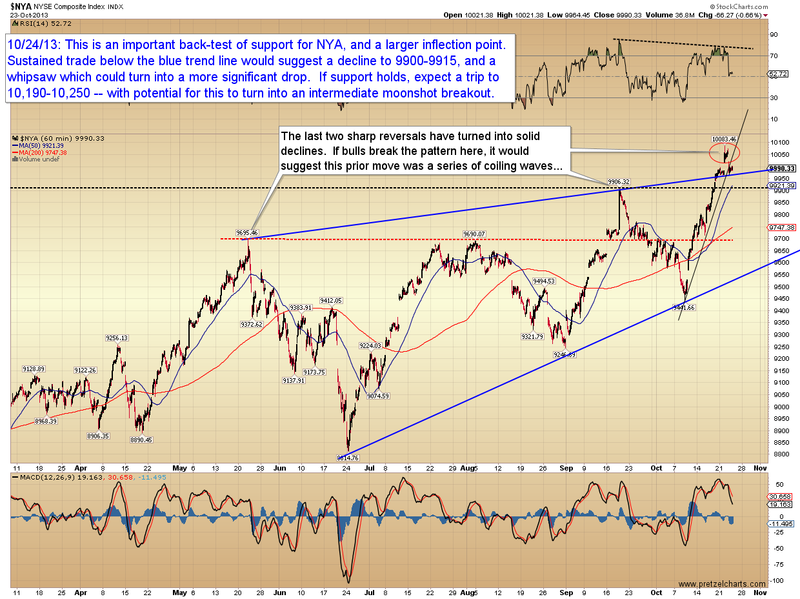 The NYSE Composite (NYA) paints a slightly different picture than SPX in a couple ways. What's most interesting on NYA is the island reversal at the high -- we haven't seen an island reversal from a high since back in the day when Miley Cyrus was still perceived as wholesome. 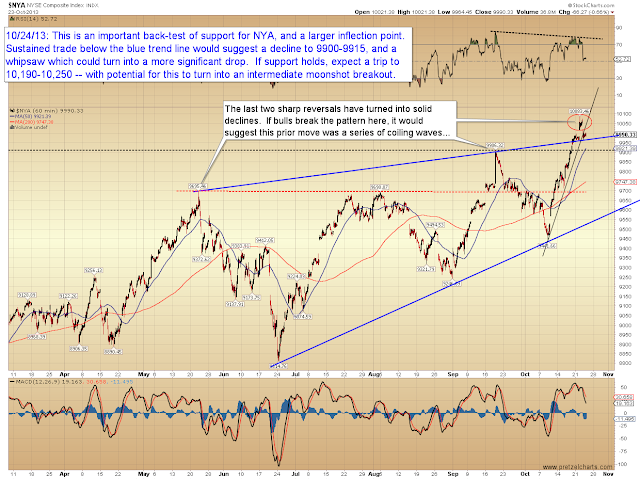 The other interesting footnote on this chart is the fact that NYA is currently above blue trend line. In conclusion, from an Elliott Wave perspective, the near-term pattern which looks best to my eye suggests the decline still has farther to run -- however, from a classic technical analysis standpoint, bulls have so far held support. The battle in this inflection zone continues to appear to have larger implications for the broad market. Trade safe. Think it's still a bit early to speculate on bearish potentials although this bull market is 4.5 years old which is a bit longer than the 3.8 years for the average bull market run. It seems that as long as this bull is being fed QE steroids, it's a very happy bull. Since the economic recovery is still weak, this bull will still be maintained on a steady diet of QE. 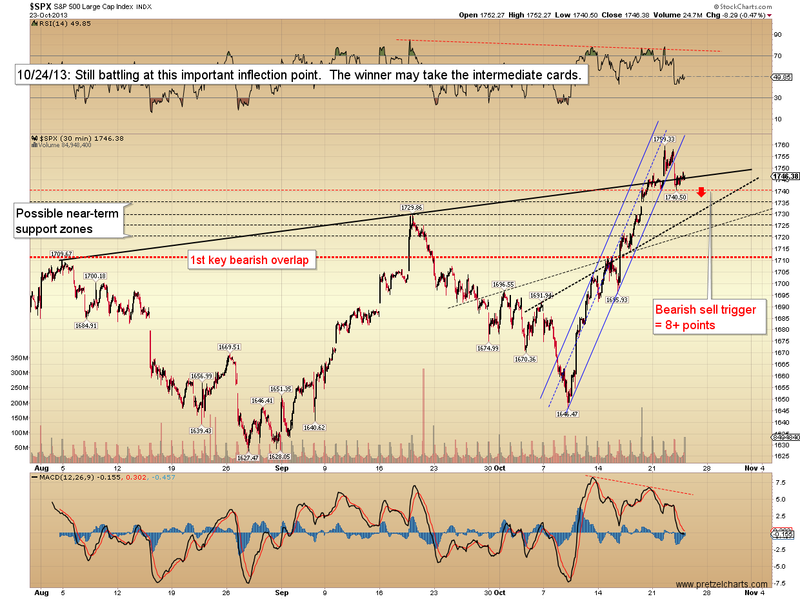 So unless something happens to shake up the markets I don't see a bearish outlook. Perhaps a pullback (<5%) or maybe even a correction (>5%) will happen as markets get more overbought. Then again, markets have never experienced this levels of QE before (to my knowledge) so we're in uncharted territory here.